"This is the End...beautiful friend, the End..."
"Humidty. The humidity. It's impossible for words to describe what is necessary to those who do not know what humidity means..."
No, that's not Cambodia. That's our yard. Honest. It's just that I woke up this morning and could have sworn that I was on the set for Apocalypse Now, without benefit of the presence of Martin Sheen. That is a split-leaf philodendron the size of a Volkswagen bus you are looking at. I am showing this to my readers so you will know how utterly dedicated I am to providing you with a photograph of a knitted object being blocked in the sunlight. I know, there is no knitted object in this picture You have to wait. This is a movie set, remember? So dedicated am I, in fact, that, on the Fourth of July holiday weekend in Louisiana, I actually went on a mission outside the protection of the life-support system (known as a "house" to people in other places). And now, like Willard en route to do a Cuisinart number on Colonel Kurtz, let us clamp a machete between our teeth and venture into this heart of backyard darkness, this 90-percent-humid and mosquito-filled jungle, risking heatstroke, poison ivy, flying roaches, fire ants, fleas, poison oak, wasps and West Nile virus. Remember to hum, "The End" to yourself as you do this. You can't sing, because you have a machete in your mouth. You have to hum. 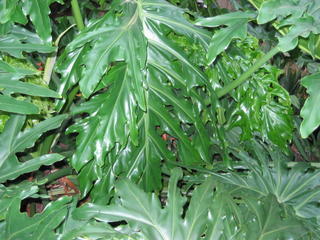 Venturing deeper into the jungle now, we shall find a patch of bamboo I call the "Lizard Lounge." I like lIzards. I like them a lot. They are cute, alert little critters and they eat bugs. This is the Big Lace Shawl for Me, made from hand-dyed, handspun wool that was a very generous gift from a very special friend. Generous indeed when you consider that there is about a quarter of a mile of yarn in this thing. You are looking at my favorite blocking method. 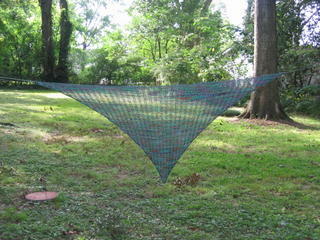 The shawl is deployed on a web of fishing line and stretched out between two trees (outside the frame of the photo). 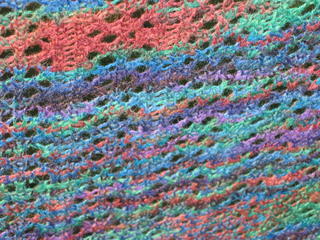 I'm very pleased at the way the shawl came out -- bouncy drape and good color distribution. It was also very nice to have only a few small color pools in this vast amount of handpainted fabric, color pools which scattered themselves so randomly throughout the shawl as to look like an integral part of the design. I am very happy about that. It is light, airy and warm. Not that I need warm now, but I will in the fall. This was a delightful, one-of-a-kind, handspun yarn, so if I work this up into a pattern for sale, I will suggest Koigu as a substitute. Lisa Louie from Hawaii will recognize this as the shawl which was only the size of a bandanna when she passed through town this spring. Big hugs to Lisa for calling to be worried about us, as Hurricane Dennis takes aim down here in Mother Nature's Bowling Alley. And speaking of bowling, Lisa and I were able to meet because she and her husband Paul flew all the way to Baton Rouge to participate in the mother of all bowling tournaments, with over 13,000 bowlers participating, and his team came out 56th in the tourney, an incredibly high rank, the bowling equivalent of getting a perfect score on your SAT. You go, Paul! To fringe, or not to fringe? 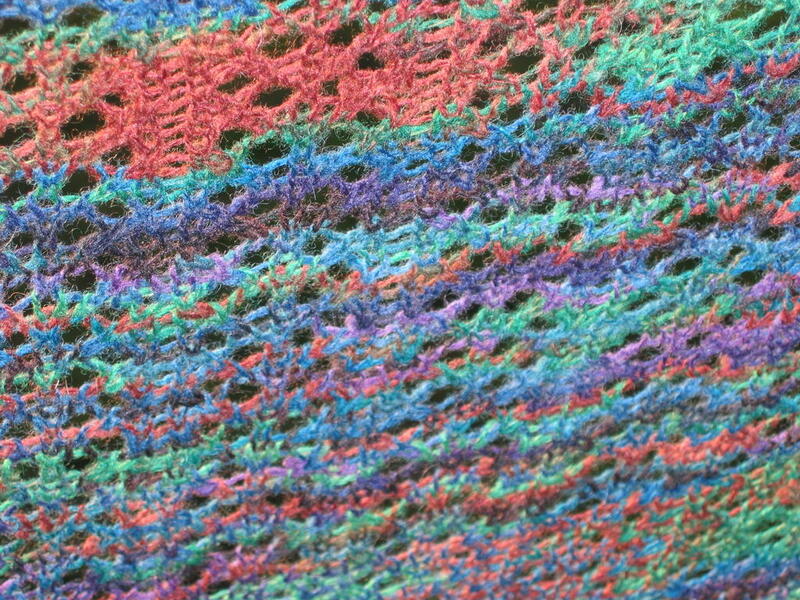 Looking at it blocked, it will already be huge, a fingertip-to-fingertip shawl on a long-armed person such as myself, and it will already hang down to thigh level at the back point. Suggestions? Add fringe, or make a matching beret? When I asked you the same question about my Charlotte's Web, you said, "when in doubt, fringe." It was the right advice then, and I think it would add luxury to your beautiful shawl. Can't block that way up here on the lake - no big trees. However, NO SQUIRRELS, either! VBG! Your shawl is absolutely gawjuss, Dez! I'm not much of a fringe person, so I'd vote for the chapeau. I really like your method of blocking. I'll have to try that with the next lace project.